After many months of training, much insecurity, and lots of stubbornness, yesterday I ran my first Half Marathon, at the Scotiabank Toronto Waterfront Marathon event. It was hard, but good, and I would/will do it again. A Half Marathon is 13.1 miles or 21 km, as compared to the full Marathon which is 26.2 miles or 42 km. I don’t mind saying that I am sufficiently buoyed by my finish to try the Half again, but that the Marathon is indeed a level of commitment above the Half. Full Marathoners, I salute you. But thanks for letting us Half-ers join the party. The final kilometre was, I also don’t mind saying, the best kilometre I have ever run in my life. I would like to do it again, please. And thanks to my friends and sister who were waiting at the end. It was great to have someone there to celebrate with. Over the last few days I’ve heard a lot of people using the word “crazy” to refer to this kind of stuff. And I don’t have disrespect for that, because you know, it is sort of crazy. There is no immediate practical reason for anybody to do anything like this – let alone the FULL Marathon which is something that tests the physical limits of what the human body is capable of. (although I do think the benefits of running and distance training are many, but they accrue and are apparent in the long term) But I don’t think it’s any less crazy than any other mindful pursuit or commitment. We are all of us doing our own version of crazy. And I’ll say this much – running and then crossing a finish line, after any distance, is one of the most rewarding things I think I have ever done, and I think as many people as possible should have the benefit of that experience. 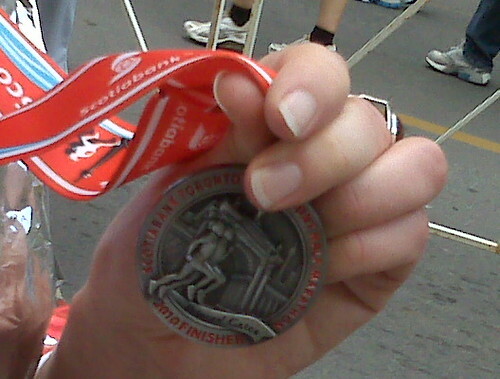 Today, my legs are tired, but I am glad to have finished. And I have the shiny finisher’s medal to prove it! Let’s do it again some time. How wonderful for you! Congratulations! I thought beating last year’s time in a 10K was a great accomplishment for me this summer, but that’s only half of what you ran. Way to go! hooray! go glenna! this is crazy awesome. Seriously, good for you; I can’t even imagine trying, but I so admire the people that do…don’t get it, but admire them. Congrats!! That takes a lot of guts and hard work!! Be proud of yourself!! I don’t think it’s crazy at all! Congrats!! Good for you!!! I admire your determination. I also, love your work. Congrats that is wonderful I don’t think your crazy I think it takes guts to do that cause no everyone can. Way to go. WOOOHOO! WOW I am all i awe. Congrats. You are an inspiration. I was supposed to walk the half on Sunday, but I fell down on the job of training this summer. Way to go – what an achievement. Go celebrate with a few gorgeous skeins of something special!! Congrats Glenna! Chris did a half marathon a coupe of years ago and I don’t think I’ve ever been so proud in all my life! It’s just such an amazing thing to set yourself a goal (a goal that were you to have attempted it 5 months ago you probably wouldn’t have achieved) and then put your mind to it and train, then actually make it happen and cross the finish line. It’s a big deal. Congrats! That’s amazing, congratulations!! I’m seriously impressed. Congratulations! I could only walk 36k in the full marathon and I am still reeling with disappointment and fatigue. Keep you medal shiny, I intend to have one to show you next year and we will compare. Yay! 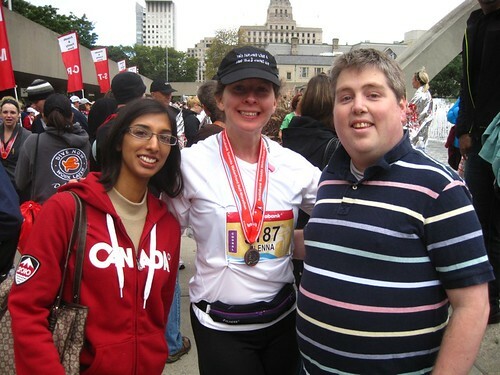 I am a new reader who is a knitter AND a runner and ran the Scotiabank last year…or the year before, can’t remember. Finishing your first race, whatever distance, is such an amazing feeling. Way to go!! If you’re daunted by the full (as I am), might I suggest the 30K Around the Bay in Hamilton in March? It’s the oldest road race in North America and is a good distance in between the half and full. I did it once and am happy I did. YAY! Go you, Glenna! I think it is fantastic!! Congrats, congrats!! Congrats! We’re all proud of you. Congratulations! Did you get the time you hoped for? 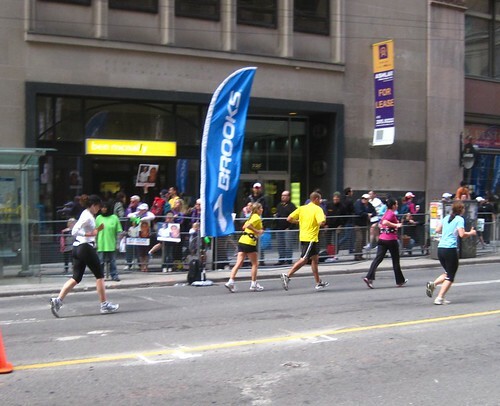 Another friend of mine in Toronto ran a half recently – I assume it must have been the same one! I’m doing a full marathon on Sunday. Eek! Congratulations! I don’t run (walk very fast sometimes, maybe jog across busy intersections, but not so much with running), but can certainly appreciate the work and dedication that goes into running ANY sort of race, let alone a half-marathon. Good. For. You. Congratulations! That is an amazing achievement and you actually did it! What a great experience for you. Well done! All your hard work must be so satisfying. Be proud. Great job Glenna! I love the smile in the pic, and the pic of you running even more! Congrats, and gear up for HM #2!!! Congratulations! And, please, run again! Not crazy at all! Totally awesome, in my opinion. Congrats!! Congratulations!!! That’s an accomplishment to be proud of! 🙂 My husband runs marathons, whiuch I think is amazing. I haven’t even run a 5K. Maybe someday. But a half marathon?? You’re awesome! Wahoo! I’m running a marathon in just over 10 days (whimper). It will be my 3rd attempt at a finish, but the first time I’ve been serious about training. It IS a huge time commitment, but I agree that the benefits of committing to training have been numerous. I hope I get to experience the same euphoria that you did in the last mile. Congratulations! You totally look like a runner. And thanks for keeping me running too! Congrats on finishing your half-marathon! I was supposed to run my first 10K this weekend, but life got in the way. I’m proud that you accomplished this goal and hope you get many more under your belt in the future – the medals are always fun to collect.